GOVERNOR DICKSON SIGNS C-of-O FOR BRASS FERTILIZER AND PETROCHEMICAL COMPANY. Governor Seriake Dickson on Wednesday, November 1, 2017 has signed the Certificate of Occupancy for the Brass Fertilizer and Petrochemical Company Limited (BFPCL). With the signing, the project is set to kick-off in Brass. 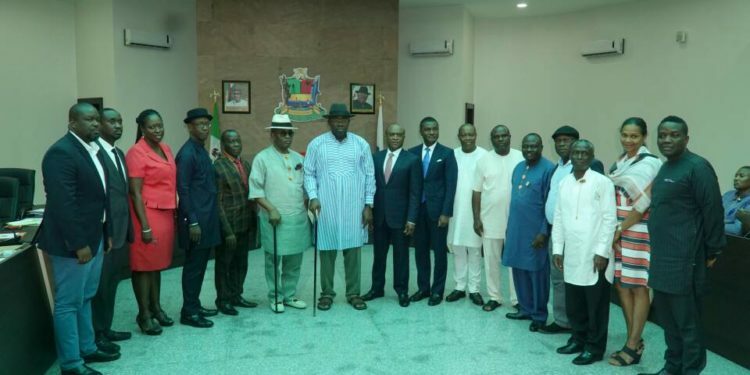 Governor Dickson, while receiving the management of the company further announced the suspension of payment of all fees and levies by the company for 2 years underscoring the fact that Bayelsa State is a development partner in the project. Speaking earlier, Chief Ben Okoye, the Executive Vice Chairman of the company said the Brass Fertilizer and Petrochemical Company Limited has secured $6 billion offshore facility for the takeoff of its methanol plant in Bayelsa State. This according to chief Okoye is the first project to provide a $1billion equity fund in Africa, which will be a legacy project of the Governor Dickson-led Restoration Administration. “The project is designed to be built in two phases. Phase one which is expected to come on stream in 2020, will produce 1.66 million metric tonnes of methanol and 1.3 million metric tonnes of urea per annum. The Brass Fertilizer and Petrochemical Company Limited project will employ 15,000 workers indirectly during construction and 5,000 permanent workers after the project is completed, said Chief Okoye.